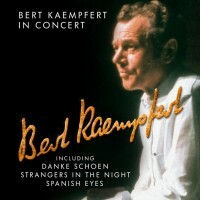 In November 1979 Bert Kaempfert and his 40-strong orchestra went on tour together with the Botho Lucas Choir, performing for the first time in Germany, Luxembourg and Switzerland before packed audiences at fourteen different venues and featuring soloists Ack van Rooyen on trumpet, Jiggs Whigham on trombone and Swedish jazz singer Sylvia Vrethammar. This tour had been preceded by a concert given on 20 June in Neu-Isenburg’s Hugenottenhalle, which Hessen Radio happened to record for television, thus making it possible, ten years later, to transfer this now historic recording on to video disc. Requiring complex digital audio-master processing, the task was carried out in London’s Mayfair Studios by John Hudson, one of the world’s leading sound engineers. In April 1991 the video disc was replaced by a video cassette. We are very pleased that “the concert event of the year”, as it was described in the press at that time, is now available on DVD.